A digital signature system is provided on a server for use by remote clients, such as by using a browser. The server generates and maintains all of the users' keys used for producing a digital signature. A user sends a data object to the server, and the server generates a digital signature for the data object using the private key stored at the server. The server then sends the digital signature to the client. 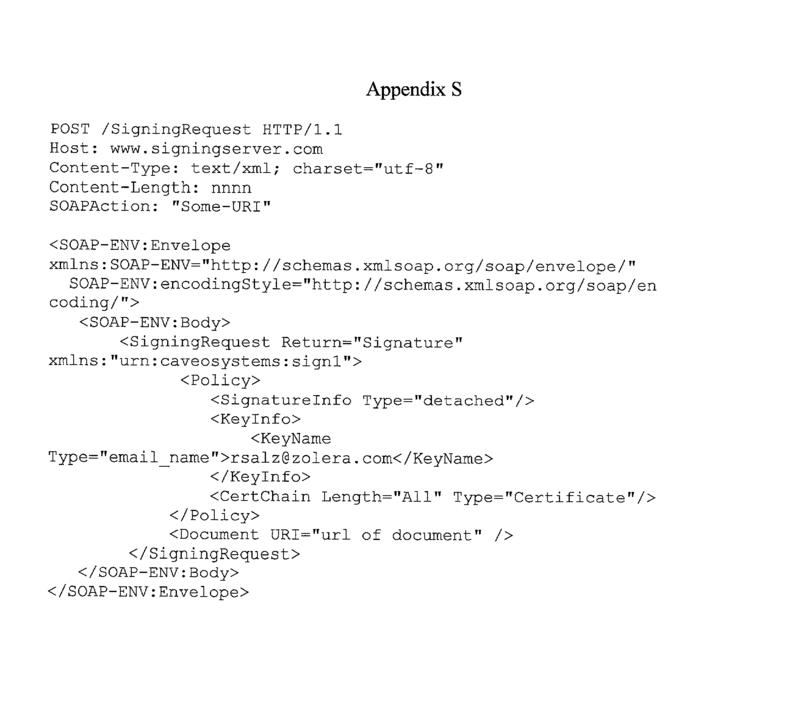 A client can, at a later time, send the signature back to the server for verification. Referring to FIG. 1, a client  100 connects to the server 120 over a communication channel such as the Internet 110. The client 100 must first authenticate itself with the signing server 120 of the present invention, and send a user or client ID 130 to the server over the communications channel. According to the present invention, the server requires authentication of all signers and verifiers in order to use its signing services. Signers and verifiers using the system are registered on the server using the Secure Sockets Layer (SSL). The default authentication is the name/password combination secured by SSL, however, in alternate embodiments, other authentication systems may be used. Client-side certificates are an authentication option. All signing and verification operations are logged at the server. The client can authenticate to the server using one of several methods. The client sends information representing its identity to the server using either a password, an encrypted data channel, a public key-based processing step, or by presenting a client certificate. The client and server can mutually authenticate using a zero-knowledge proof algorithm. After the server has authenticated the identity of the client, the server assigns a private key to the client. The particular signing key to be used by the server is specified using the user/client ID that is passed to the server by the client. In the preferred embodiment, the e-mail address of the user is used to identify the user, and is named within the Client ID  130. FIG. 2 shows a Signing Request and a Signing Response according to the present invention. A client  100 sends a Signing Request and a data object 210 to a server 120 over a connection such as the Internet. The server 120 processes the object and generates a signature 225 and assigns it to the object, creating a signed object 230. The server then 1 returns a Signing Response and the signed object to the client 100. The Signing Response includes “Success” or “Failure”, indicating whether the signature was successfully generated. FIG. 3 shows a Verification Request and a Verification Response according to the present invention. Client  100 can later send the signed object 230 to the server 120 for verification. The server verifies the signature by obtaining the data object 210 and the hash from the first signature 225 from the signed object. The server generates a second hash 310 using the data object and compares the hash from the first signature 225 with the second hash 310. If the signatures match, the signature is valid. The server returns an indicator 320 showing the status of the signature, either valid or invalid. Referring to FIG. 4, client A  405, client B 100 and client X 435 are all clients using the digital signing server 120. The server 120 generates and assigns private keys to all of its clients, and as shown in this example, has generated and maintains private keys 410, 420, 430. When client 100 sends a signed object 230 to server 120 for verification, the server 120 determines, based on a specified system policy, available data or a specified algorithm, which private key 420 to use to generate a verifying hash. In the preferred embodiment, the particular signing key to be used is specified using the user email name, or Client ID 130 that was shown in FIG. 1. The client ID, or identification element, was passed to the server by the client upon authentication, as shown in FIG. 1. In alternate embodiments, the key may be specified using an issuer name and serial number, a key identifier, or by other techniques. The identification element is discussed in more detail below. Referring to FIG. 5, the method to pick a private key to generate a signature for an object is shown in greater detail. The server uses the client ID  130, and other data 510 to select a private key from the keys 410, 420, 430 that are stored on the server. The server picks a key to use at 520, and generates a signature for object 210 by hashing the object and then encrypting the hash. The signature is stored with the object 210 in a new object, the signed object 230. As shown in FIG. 6, the system generates a signature of a data object  210. Object 210 is hashed, according to a predetermined hash function 620. The client ID is determined by the server, and is used by the server to select a key 420. The server also produces a timestamp, and generates a signature 530 using the hash, the chosen key, and the timestamp. These functions are described in more detail below. As shown in FIG. 7, the signature  530 can also be generated using the hash of the object, the private key, and the server key, and that signature is incorporated into a signature 530 for the client. As shown in FIG. 8A, the system generates a signature  530 for data object 210, creating signed object 230. As shown in FIG. 8B, the signature can be detached. In this case, the signed object 230 contains the address of the data object 810 and the signature 530. FIG. 8C shows an enveloped signature. Here, the signed object 230 contains the data object 210 itself and the signature 530. FIG. 8D shows an enveloping signature, where the signature 530 is placed within the original data object 210, which becomes the signed object 230. As shown in FIG. 8E, a hash 820 of the data object 210 can be stored in the signature 530, which becomes the signed object 230. 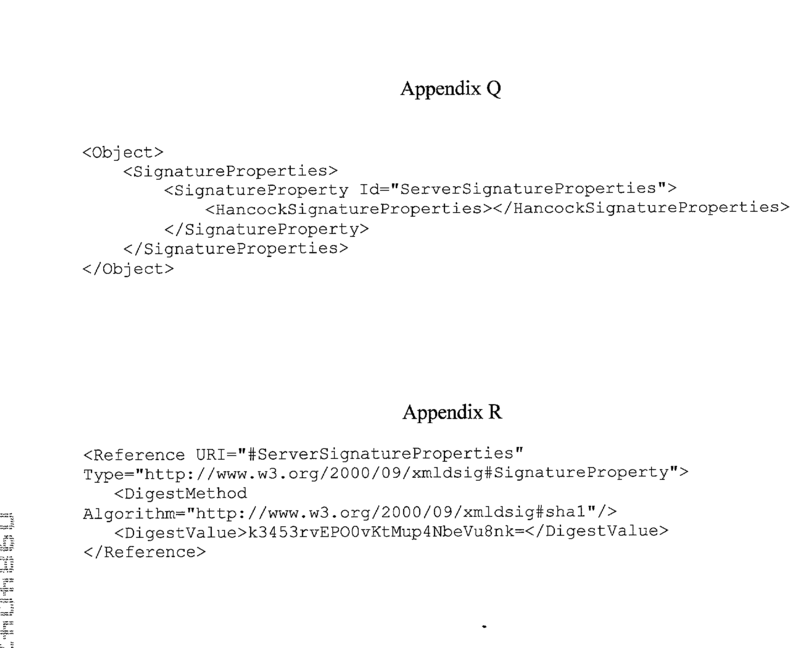 A hash of the object is stored in the signature when the client requests that only the signature be returned. (c) determining whether the comparison value and at least a portion of the signature meet a pre-determined criteria. 2. 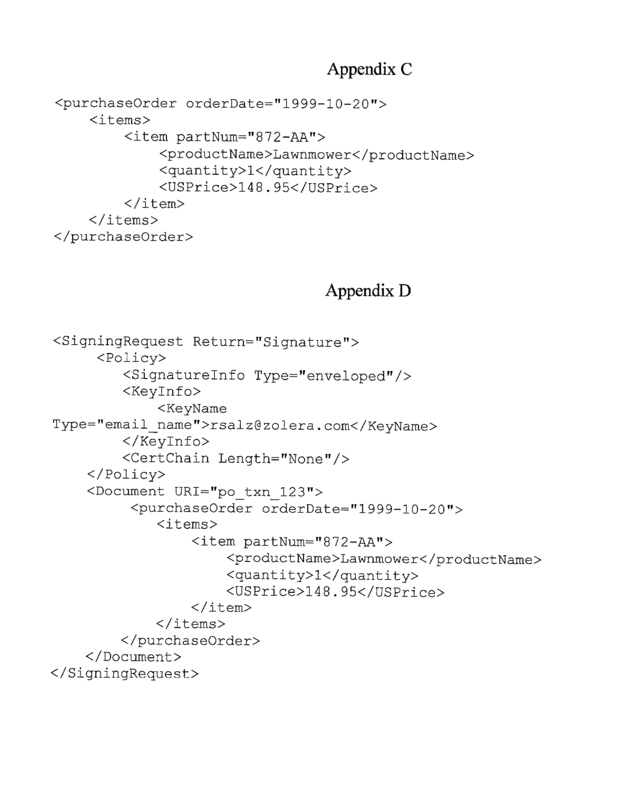 The method of claim 1 wherein the data object comprises a document. 3. The method of claim 1 including the further step of, in the server, authenticating the client. 4. The method of claim 3 wherein the client is authenticated by the server using information representative of the client. 5. The method of claim 4 wherein the information representative of the client comprises a password provided by the client. 6. The method of claim 3 wherein the client is authenticated by the server using an encrypted data channel. 7. The method of claim 6 wherein the encrypted data channel utilizes a SSL protocol. 8. The method of claim 3 wherein the client is authenticated by the server using a public key-based processing step. 9. The method of claim 8 wherein the public key-based processing step includes the presentment of a client certificate. 10. The method of claim 9 wherein the client and server mutually authenticate using a zero-knowledge proof step. 11. The method of claim 3 including the further step of, in the server, creating and managing private keys to use in the step of generating the signature. 12. The method of claim 11 wherein the server assigns a private key to the client. 13. The method of claim 12 wherein the private key assigned to the client is determined based upon the information representative of the client. encyphering the hash total using the private key. 15. The method of claim 1 wherein the signed object comprises the signature and an address of the data object. 16. The system of claim 1 wherein the signed object comprises the signature and the data object. attaching the signature to the signature field associated with the data object to create a signed object. 18. The method of claim 17 including the step of, in the server, authenticating the signed object by verifying the signature attached to the signature field of the signed object. (e) determining whether the comparison value and at least a portion of the signature meet a pre-determined criteria. 20. 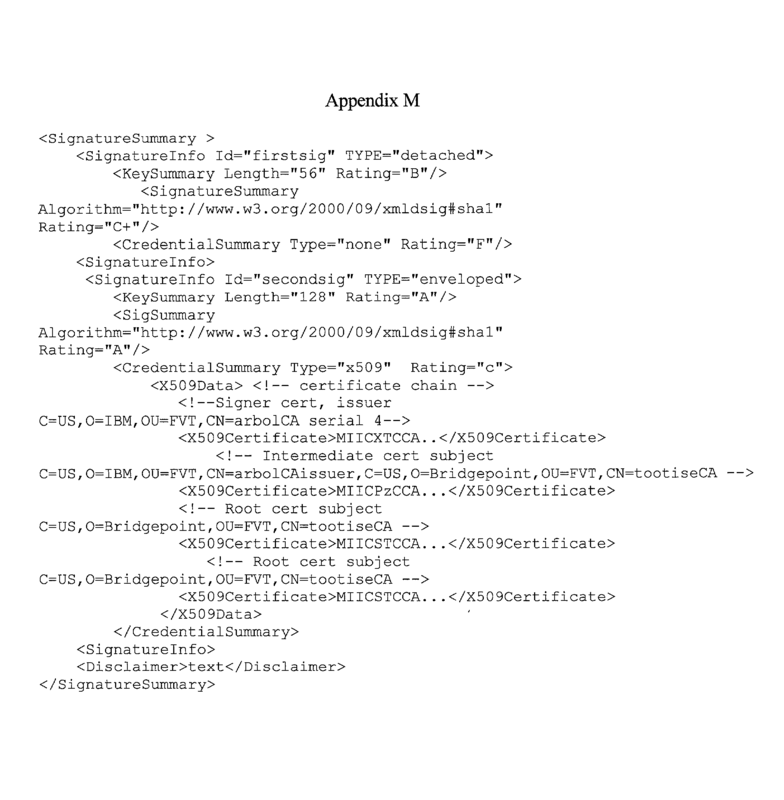 The method of claim 19 wherein the property field further comprises a timestamp. 21. The method of claim 20 wherein the property field further comprises an identifier used to look up a key stored at the server. 22. The method of claim 19 wherein the property field further comprises key information used to generate the comparison value. 23. The method of claim 17 wherein the descriptor further comprises a plurality of property fields. 24. The method of claim 23 wherein at least one of the property fields further comprises data that is private to the server. 25. The method of claim 23 wherein at least one of the property fields further comprises additional data that is signed by a key private to the server. 26. The method of claim 25 wherein the additional data is derived by processing the data object using a pre-determined function. 27. The method of claim 26 wherein the pre-determined function is a hash function. 28. The method of claim 26 wherein the pre-determined function is a transform function. 29. The method of claim 25 wherein the additional data is obtained from a device. 30. The method of claim 29 wherein the device receives the data object prior to subsequent processing by the server. 31. The method of claim 29 wherein the device does not receive the data object. 32. The method of claim 29 wherein the device further comprises a device for generating a timestamp. 33. The method of claim 29 wherein the additional data, after being obtained from the device, is used by the server to generate the signature. 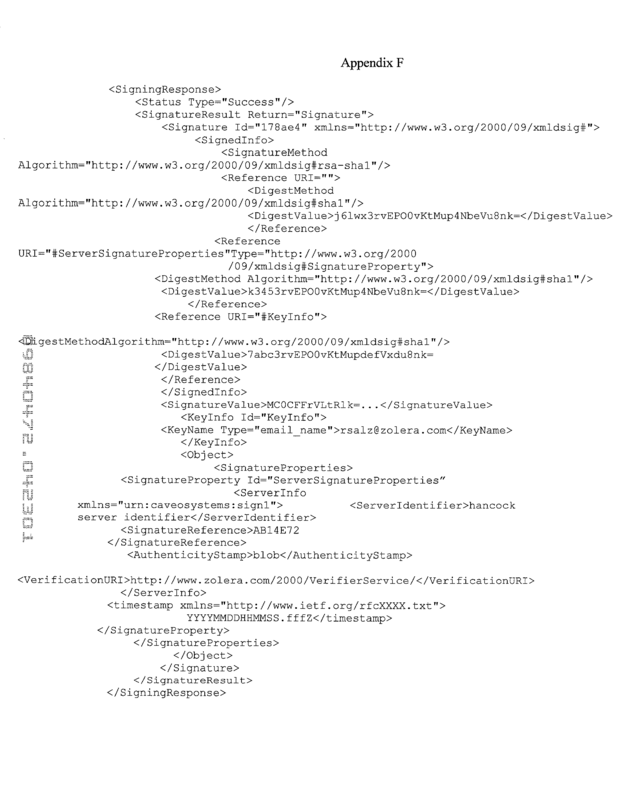 receiving, at the client, input form data corresponding to the HTML form tag, generating secure form data by applying the specified outgoing transmission security cryptographic protocol of the HTML form tag to the input form data, and transmitting to the server a return message including the secure form data. sending the digital signature to the client. 36. The method of claim 35 wherein the digital signature is contained within a signed object. performing a pre-defined encryption function using the private key on the hash value. 38. The method of claim 37 wherein the signed object comprises the digital signature and an address of the data object. 39. The method of claim 37 wherein the signed object comprises the digital signature and the data object. 40. The method of claim 37 wherein the signed object comprises the digital signature contained within the data object. 41. The method of claim 36 wherein the signed object comprises a hash of the data object contained within the digital signature. verifying the digital signature upon request by the client. verifying the digital signature if the comparison value and at least a portion of the digital signature meet a predetermined criteria. 44. The method of claim 43 wherein the signed object comprises the digital signature and an address of the data object. 45. The method of claim 43 wherein the signed object comprises the digital signature and the data object. 46. The method of claim 43 wherein the signed object comprises the digital signature contained within the data object. 47. The method of claim 43 wherein the signed object comprises a hash of the data object contained within the digital signature. 48. The method of claim 35 further comprising, authenticating a user, by the server, before providing access to the system. 49. The method of claim 48 wherein authenticating a user further comprises receiving a user ID and a password from the client. 50. The method of claim 49 further comprising assigning, by the server, a private key to the client based upon the user ID. 51. The method of claim 35 further comprising assigning, by the server, a private key to the client based upon a system policy and data obtained from the client. wherein the server generates the encrypted field by hashing the data object according to a predefined hash function to create a hash, and encrypting the hash using the private key assigned to the user. 53. 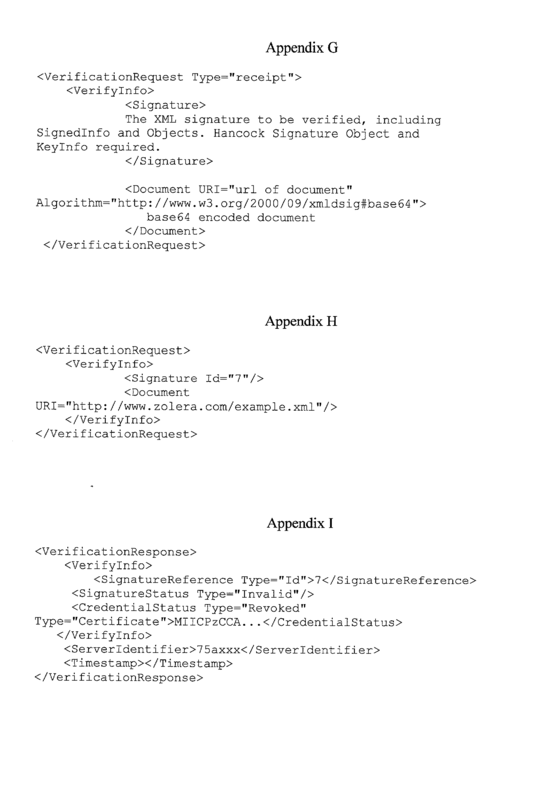 The method of claim 52 wherein the digital signature further comprises a server key. 54. The method of claim 43 further including generating a verification response at the server and transmitting the verification response to the client. 55. The method of claim 54 further including generating a verification signature for the verification response at the server and transmitting the verification signature to the client. 57. The system of claim 56 wherein the data object comprises a document. 58. The system of claim 56 further comprising means for obtaining information representative of the client to authenticate the client. 59. The system of claim 58 further comprising means for creating and managing private keys used to generate the signature. 60. The system of claim 59 further comprising means for assigning a private key to the client. 61. The system of claim 60 wherein the private key is assigned to the client using the information representative of the client. 63. The system of claim 56 wherein the signed object comprises the signature and an address of the data object. 64. The system of claim 56 wherein the signed object comprises the signature and the data object. means for attaching the signature to the signature field associated with the data object to create a signed object. 66. The processing system of claim 65 further comprising means for authenticating the signed object. 67. The processing system of claim 66 wherein the means for authenticating the signed object is further comprised of means for verifying the signature attached to the signature field of the signed object. (e) means for determining whether the comparison value and at least a portion of the signature meet a predetermined criteria. 69. The processing system of claim 67 wherein the property field further comprises a timestamp. 70. The processing system of claim 67 wherein the property field further comprises an identifier used to look up a key stored at the server. 71. The processing system of claim 67 wherein the property field further comprises key information used to generate the comparison value. 72. The processing system of claim 67 wherein the descriptor further comprises a plurality of property fields. 73. The processing system of claim 72 wherein at least one of the property fields further comprises data that is private to the server. 74. The processing system of claim 72 wherein at least one of the property fields further comprises additional data that is signed by a key private to the server. 75. The processing system of claim 74 wherein the additional data is derived by processing the data object using a pre-determined function. 76. The processing system of claim 75 wherein the pre-determined function is a hash function. 77. The processing system of claim 75 wherein the pre-determined function is a transform function. 78. The processing system of claim 74 further comprising a device for providing the additional data. 79. The processing system of claim 74 wherein the device receives the data object prior to subsequent processing by the server. 80. The processing system of claim 74 wherein the device does not receive the data object. 81. The processing system of claim 74 wherein the device further comprises a device for generating a timestamp. 82. The processing system of claim 74 wherein the server generates the signature after obtaining the the timestamp from the device. transmitting means for sending the digital signature from the server to the client. 84. The digital signature system of claim 83 wherein the digital signature is contained within a signed object. means for performing a pre-defined encryption function using the private key on the hash value. 86. The digital signature system of claim 85 wherein the signed object comprises the digital signature and an address of the data object. 87. The digital signature system of claim 85 wherein the signed object comprises the digital signature and the data object. 88. The digital signature system of claim 85 wherein the signed object comprises the digital signature contained within the data object. 89. 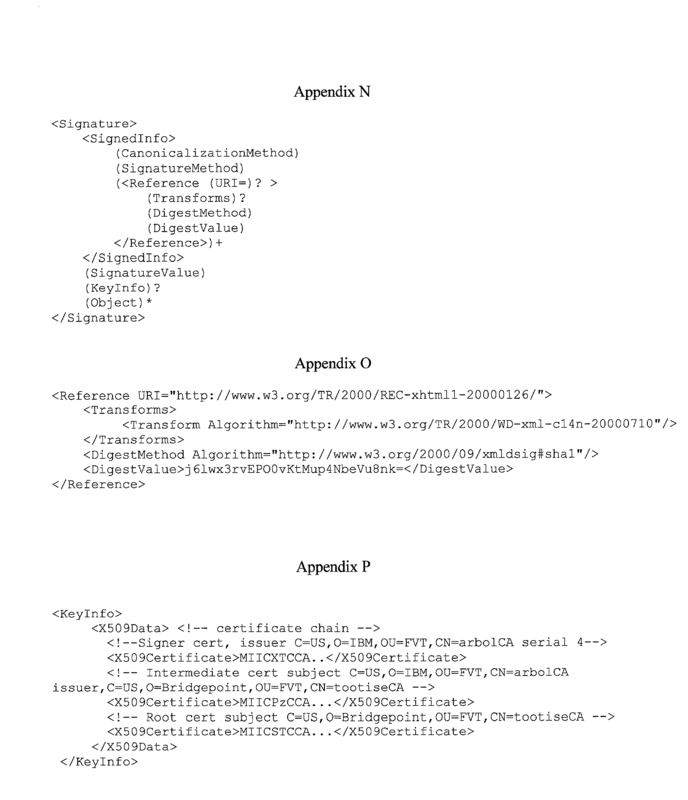 The digital signature system of claim 85 wherein the signed object comprises a hash of the data object contained within the digital signature. means for verifying the digital signature if the comparison value and at least a portion of the digital signature meet a predetermined criteria. 92. The digital signature system of claim 91 wherein the signed object comprises the digital signature and an address of the data object. 93. The digital signature system of claim 91 wherein the signed object comprises the digital signature and the data object. 94. The digital signature system of claim 91 wherein the signed object comprises the digital signature contained within the data object. 95. 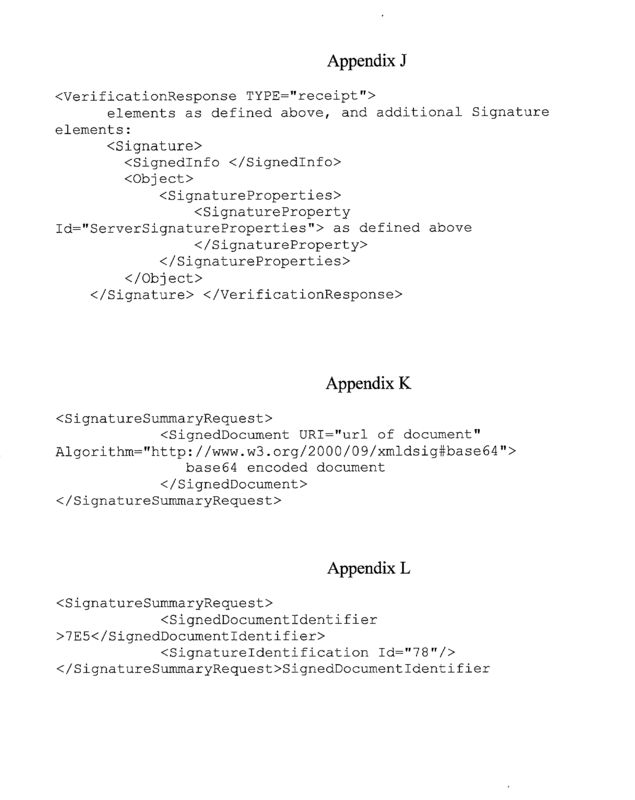 The digital signature system of claim 91 wherein the signed object comprises a hash of the data object contained within the digital signature. 96. The digital signature system of claim 91 further comprising means for authenticating a user before providing access to the system. 97. The digital signature system of claim 96 wherein means for authenticating a user further comprises means for receiving a user ID and a password from the client. 98. The digital signature system of claim 97 wherein the server assigns a private key to the client based upon the user ID. 99. The digital signature system of claim 98 wherein the server assigns a private key to the client based upon a system policy and data obtained from the client. wherein the server generates the encrypted field by hashing the data object according to a predefined hash function to create a hash, and encrypts the hash using the private key assigned to the user. 101. 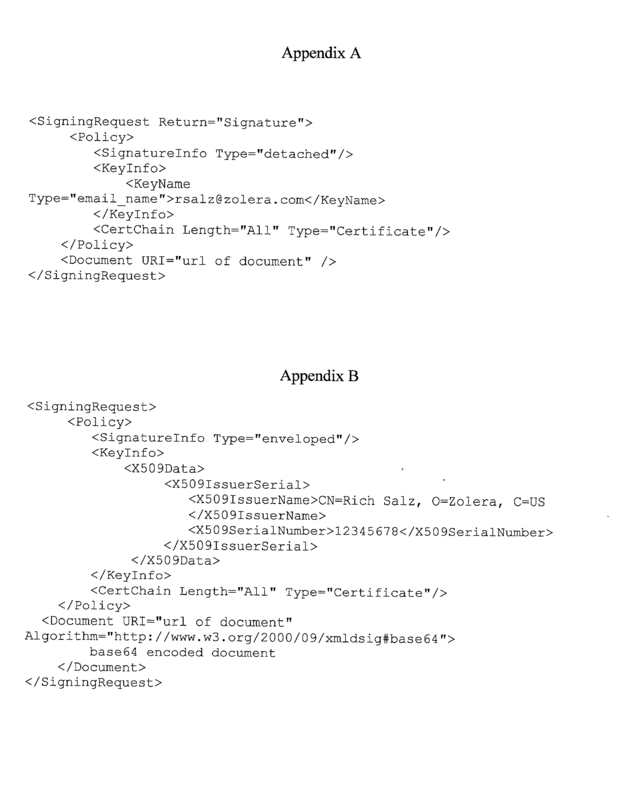 The digital signature system of claim 91 wherein the digital signature further comprises a server key. means for transmitting the verification response to the client. 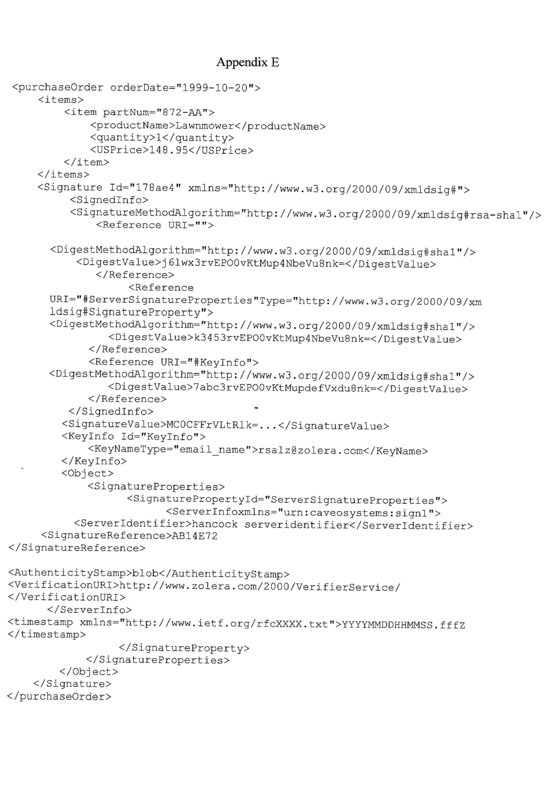 means for transmitting the verification signature to the client.